Got leftover Halloween candy? 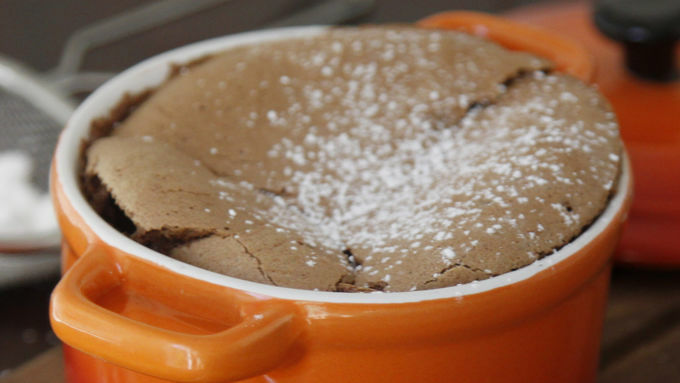 Transform it into mini-chocolate cakes courtesy of this flour-free recipe. 1. Heat oven to 325°F. Spray 8 (7-oz) ramekins with cooking spray. Set aside. 2. In large microwavable bowl, microwave butter, candy drops and chocolate chips on High in 30-second increments, stirring after each, until completely melted. Cool slightly. 3. While chocolate is cooling, in another large bowl, beat egg whites with electric mixer on high speed until stiff peaks form. Gradually add sugar, beating until glossy. 4. With whisk, beat egg yolks one at a time into chocolate mixture. Add half of beaten egg whites; fold in with rubber spatula until combined. Carefully fold in remaining half of beaten egg whites. Spoon mixture evenly into ramekins. 5.Bake 35 to 45 minutes or until cakes pull away from sides of ramekins. Sprinkle with powdered sugar.